I was recently contacted by a customer who enquired about one of the old Blue Lizard paperweights, these were made in 8 different colours with 8 different lizards using what I would call “double series twists”. it was at this point that I thought about the evolution of change that some of my designs go through over the years. I have always believed that from one design you should be able to make another 10 given time. 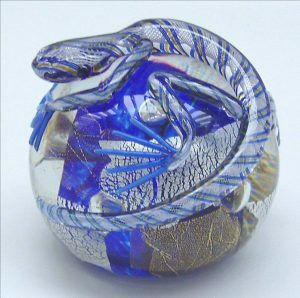 For example in 2002 Twists Glass Studio won the Giftware Association Award for best collectibles with this “Lizard Paperweight” design, in 2010 we decided that they needed a slight change and the bodies became a lot more colourful and the twist a lot simpler. Twists Glass Studio “Blue Lizard Paperweight” 2002-2010. 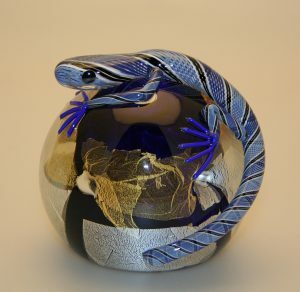 Twists Glass Studio “Blue Lizard Paperweight” 2010-now. 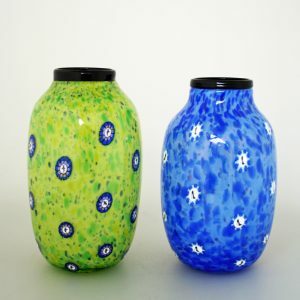 Although the paperweight is a simple shape this design with the lizards on top has remained constant. The basic paperweight design is eye catching, with little technical merit, the lizard however is substantially more of a challenge. The second set of images again show only slight change to shape, added with a different colouring technique and more complex murine. These two images may look to some as completely different with no evolution of design occurring, this shows how versatile changing one design to another can be with a little thought. It starts with an idea, pattern first, shape follows usually a chalk drawing on the floor, which is often altered slightly. Next a prototype is made, which we discuss if changes are needed, before after annealing. If I have to make anything specifically for a design this is done previously. 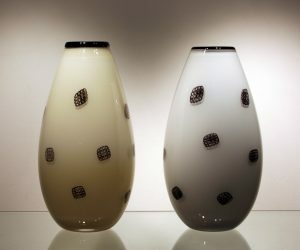 These designs then go to a marketing process, Trade Shows and Glass Fairs to see if the trade and public like it, and occasionally they get entered into trade competitions. Occasionally a design can be ahead of its time and only shows success many years later. 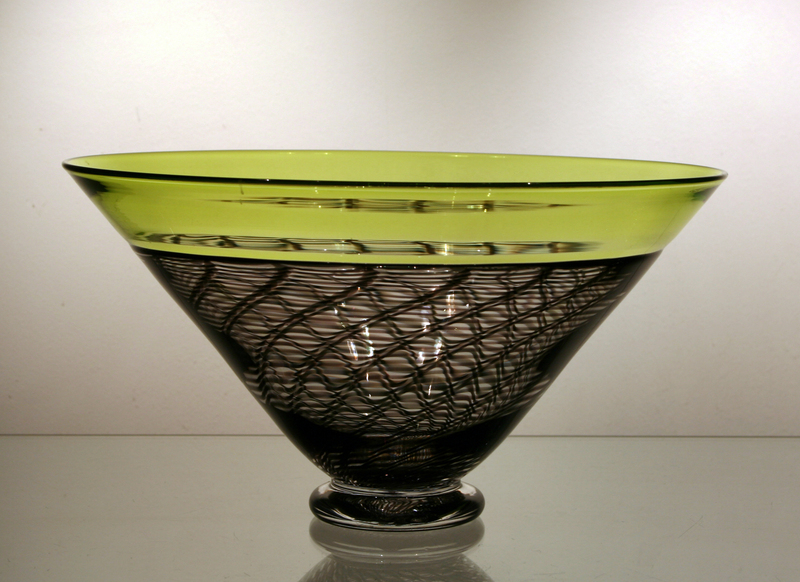 At Twists Glass Studio we are never short of quality designs, perhaps that is why we have inspired so many other makers across the UK.